That is a quote from this book Convicted: A Crooked Cop, An Innocent Man, and an Unlikely Journey of Forgiveness and Friendship. This is how too many people think it takes to live to just stay ahead. Is there another way? Is there a better way? Of course there is the Jesus way but is that practical? Can you live in this real broken world practicing the Jesus way? Colossians 3:1-15 is a beautiful and practical section of scripture. Lots of practicalities of how to live this brave life of faith, this Jesus way. We just wrestled through this section of scripture yesterday in my church. It starts out in vv. 1-4 with this good life practice: Since you have been raised to new life with Christ, set your sights on the realities of heaven, where Christ sits in the place of honor at God’s right hand. Think about the things of heaven, not the things of earth. For you died to this life, and your real life is hidden with Christ in God. And when Christ, who is your life, is revealed to the whole world, you will share in all his glory. Then comes the practicalities of how to do this. That is quite a practical list, huh? And hard. Let’s be real here. Take just one of those bullet points and meditate on it for a while. That’s your goal for today. This goal could begin a path change for you—if you are willing to put in the hard work. Vv. 6 and 7 breaks up this list with this reminder: Because of these sins, the anger of God is coming. You used to do these things when your life was still part of this world. Just a reminder of that path you used to walk on as you are attempting to walk on this new path. 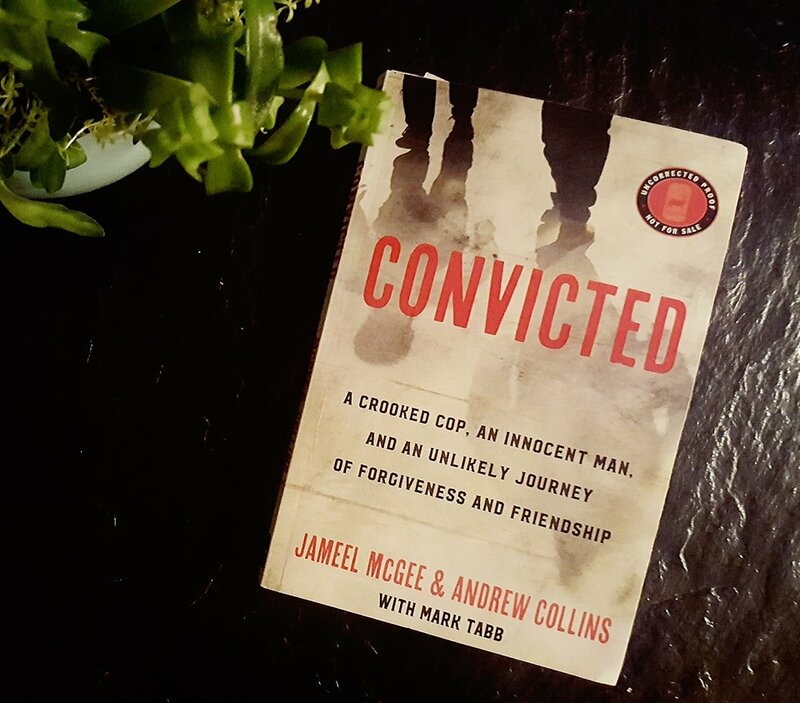 So I wrestled through these verses yesterday while I’m still moved and wrestling with this book Convicted: A Crooked Cop, An Innocent Man, and an Unlikely Journey of Forgiveness and Friendship. One of those bullet points is v. 13, Make allowance for each other’s faults, and forgive anyone who offends you. Remember, the Lord forgave you, so you must forgive others. This is hard. We feel justified in our unforgiveness for many good and real reasons. Yet Jameel McGhee was able to forgive the crooked police officer who railroaded his life. This was not just done in words and a “supposed to.” This was real and what broke a prideful now former police officer who had the white privilege and the one-ups on Jameel in so many ways. This is what has shaken me the most—how forgiveness can change trajectories in life. The question goes beyond what you might think. To understand why people had such a hard time believing I could actually forgive Drew, you have to understand the culture in which I grew up. On just a human level, people have trouble with forgiveness, but on the streets where I grew up, it’s even tougher. Every day you not only have to look out for yourself but you also better be strong or people are going to run right over you. Being strong means you avenge any wrong done to you. If someone hits you or pushes you, you have to push back harder. You don’t just let things go, because if you do, people won’t stop pushing and taking until there’s nothing left of you. When I battled God in Broadway Park (story context is when he actually forgave the police officer), this was what I was fighting against. So when people asked how I could forgive Drew, it wasn’t just that they couldn’t understand how I could turn loose the hurt. They didn’t understand how I could give up my payback, much less become friends with this guy. I’ve had a lot of conversations with people, and I always tell them the same thing: You’ve got to get God in there. In life, everything is not to be avenged. That’s not ours to do anyway. Romans 12:19-21 says Do not take revenge, my dear friends, but leave room for God’s wrath, for it is written: “It is mine to avenge; I will repay,” says the Lord. On the contrary: “If your enemy is hungry, feed him; if he is thirsty, give him something to drink. In doing this, you will heap burning coals on his head.” Do not be overcome by evil, but overcome evil with good. I told everyone that asked that I had to give everything over to God. I could not forgive Drew on my own, but God could do it. Some people looked at me as if these were just words. When I saw that look, I went even further. I told them to take a look at my life and the mess I made when I was in control and notice how change came when I surrendered to God’s control. I had those conversations while I still didn’t have a house of my own and after I moved into the house in which I now live. I wasn’t talking about a change in my circumstances but a change in me. I stopped being the angry, hurt, keep-to-himself man people had seen walking the back streets of Benton Harbor. When they see me now, they see a different me. I’m free. But I didn’t do it. God did. Pp. 196-197. Jameel was so justified to live in unforgiveness. He lost so much from another man’s sin. But what changed his life was doing this brave act of forgiveness—and meaning it, living it. It changed his own life. Wow. I’m so challenged by that. I haven’t had that big of a wrong done to me. But I’ve been wronged by this one evil person as well as some good-intentioned people who have hurt me deeply. I’m aware of these wrongs done to me not as me keeping a list but that the hurt is still there. This is what has shaken me about this book and I’m grateful for it. It is like I’m feeling these hurts again because I have not truly extended forgiveness—the vulnerable kind where I actually let it go—because I feel justified to give myself more time to work through to this vulnerable forgiveness. Giving it more time is another way of saying ignoring it. I’m justifying it because I have been justly wronged as I also know there will be no closure on this wrong. So what can change if I extend forgiveness? Me. As I’ve stated often on this blog, forgiveness is a journey. When I’m justifying my hurt I’m stuck on that journey. I’m convicted of this. (Get the play on the word convicted here with the title of the book?!) This is my restart on my journey. I’m not to the end yet of forgiveness but as long as I cannot shake Jameel’s story I will be on that journey. I’m grateful. What about you? Be brave as you restart this journey. May this story stick with you.